Sensi A & B base nutrients are easy to measure because there are only two components and have their nutrient ratios based on thousands of test gardens and research. Growers using the pH Perfect Nutrient Line will not have to worry about pH in their nutrient solutions, because the new formulas are able to adjust the pH to optimal pH range automatically! Combining a perfect pH level with these cutting edge chelates has growers reporting back with a new standard in yield expectations. As with all liquid fertilizers, we recommend shaking Sensi Bloom before use. For root-zone feeding, pour equal portions of Sensi Grow Part A and Part B until the desired nutrient strength is attained. 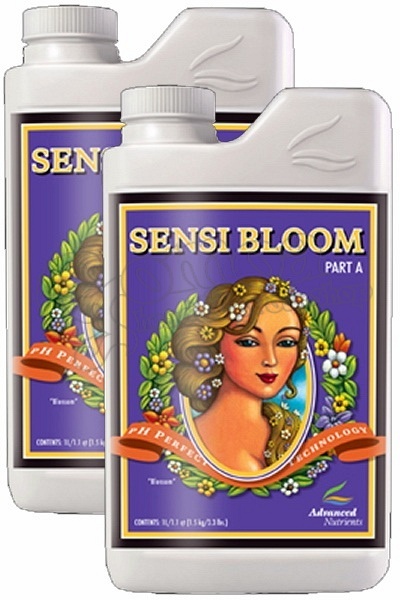 You can use Sensi Bloom on its own or in combination with other products. With pH perfect technology, you will completely eliminate checking your pH forever! As long as your water being used falls between 4.5 and 8.5 pH (which is pretty much everyone's water) - this technology will adjust your pH for you, and keep it buffered throughout your plants growth phase! PH PERFECT WILL NOT WORK IN A RECIRCULATING COCO SYSTEM!